One of my team members had a strange problem since last year. He could sign in to the Microsoft Office Communicator but could not receive messages from anybody else. On the other hand he could send messages to his contacts absolutely fine. Our TAM and his OCS team tried doing a lot of research on his production account with no avail and the problem was never resolved. 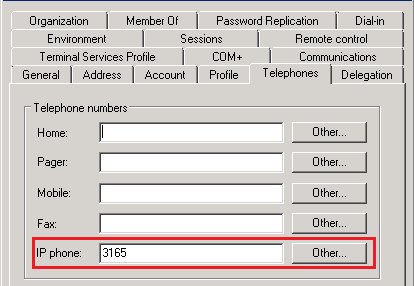 Our OCS settings does not have any configuration in enterprise voice settings that matches the otherIpPhone value. They were testing something on his account and didn’t remove this value from this user account. 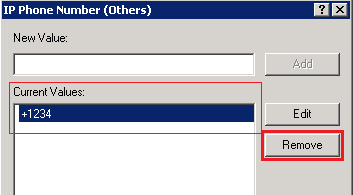 So, to remove this value we simply used ADUC (Active Directory Users and Computers). 1. Open user properties in ADUC and go to Telephones tab. Locate IP Phone and click Other button. 2. Remove the values that are incompatible with your OCS Voice configurations. 3. Ask the user to log off and log back in. Bingo! That should let him receive IMs from other users now. This entry was posted on 21/04/2010 at 5:53 PM	and is filed under OCS, OCS 2007. Tagged: Office Communicator, User cant receive messages. You can follow any responses to this entry through the RSS 2.0 feed. Both comments and pings are currently closed.